There are many ways to hipsterfy yourself around a particular topic. The most common way to is to find obscure things and make them part of your everyday routine (such as mopeds and mustache wax). Alternately, you can use more common things in a very obscure ways (bicycle polo and stemmed beer glasses). For the very artful hipster, however, doing the obscure thing is way too hipster-mainstream. Take for example the humble sage plant. Hipsters of course have found the most historic and obscure uses for this herb and made it part of their routine: brewing it in tea, burning it as incense, using it as a natural preservative, and even naming their babies after it. This is one instance where I like to pull a reverse-hipster: since any hipster can do something obscure; it’s even more hipster to do something absolutely common with sage. I like to cook with it. Sage has been a staple in our garden since I first heard Simon and Garfunkel’s Scarborough Fair. Cut fresh, I’ll throw it into stews and soups. Fresh chopped sage mixed with a little olive oil and fresh cracked pepper makes an excellent wet rub for grilled chicken. In order to keep a ready supply of sage year-round, it’s important to be able to harvest and preserve sage properly. 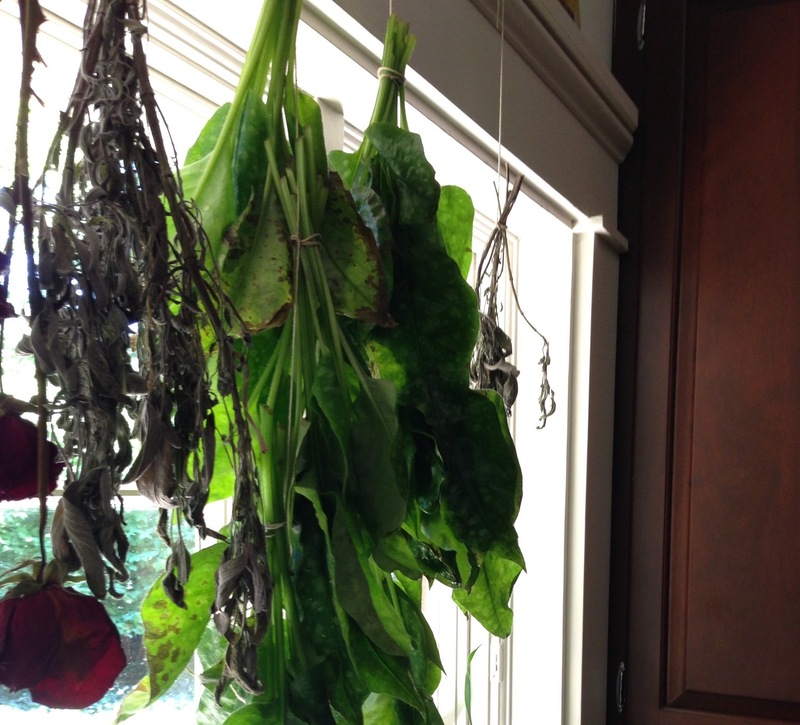 Because the sage leaf is more fibrous, I find that it takes a little extra effort to dry it out fully. Fresh lungwort hangs between bunches of sage that have been hanging for a week or more. This year I did a two-step drying process. First, I tied bunches of larger branches to hang dry in the window until the leaves were mostly dry. Second, I removed the leaves from the stems and branches and allowed them to further dry by placing them in my Costa Rican seed-drying gourd and hanging it in my window for another week or so. This little gourd was a gift from my in-laws, bought from a farmers’ market in Costa Rica. (If you don’t have a Costa Rican seed-drying gourd, you can alternatively use a brown paper bag with holes poked in it). After further hanging in the drying gourd, this sage leaf is ready to be processed. When I am convinced that the sage has dried sufficiently, it goes into the mortar and pestle. To maintain an even consistency, I push my crushed sage through a sieve before storing it in a spice jar (similar to the way I harvest basil). Sure, I don’t do any of the most obscure things that you can do with sage, but that’s just fine. You’d expect every hipster to do that, so instead I use my hand-picked organically-grown sage for common culinary uses. If it’s not obscure, at least it’s ironic.